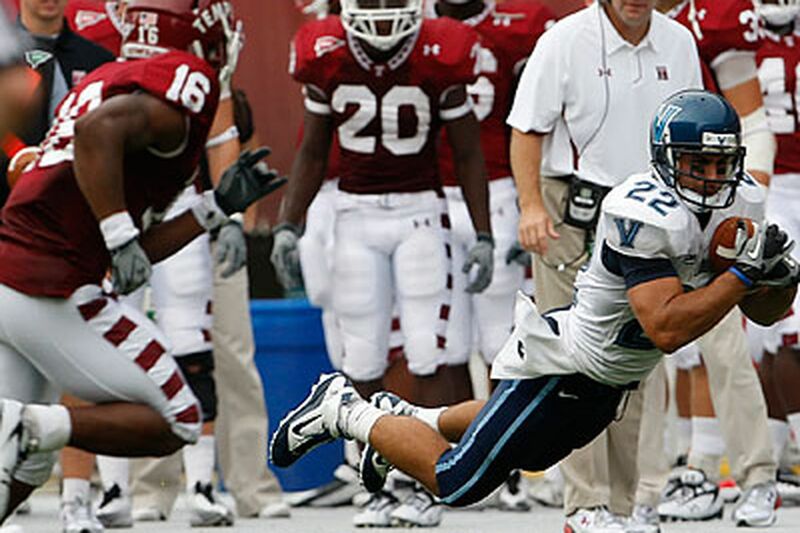 Can Villanova and Temple join football's big boys? A theoretical question: Is there a Division I-A football scenario out there that could benefit both Temple and Villanova? That would allow the two local schools to field programs that matter, in leagues with television exposure and a place at the college sports big-boy table? Yes, in fact, there is. But a lot of dominoes would have to fall for that to happen - to see Villanova in the Atlantic Coast Conference, and Temple joining forces with Big East football schools such as Pittsburgh and West Virginia. Where did this come from? Stay with it. The dominoes would have to topple, but if they start to, 'Nova-to-ACC and Temple with some Big East schools isn't outlandish. It even starts to make sense. One big domino: An outfit like the Southeastern Conference would have to raid the ACC, maybe taking Florida State or Miami or both. At that point, the ACC would need to reload, and the obvious direction to look would be north, to find some partners with Boston College and establish a real foothold in the Northeast. As for Temple, it seems like the only way the Owls can join a BCS league is if Villanova moves up, and then moves over. Even when it wasn't clear if Villanova wanted to move up, Big East sources made it clear last fall that Temple wasn't a top backup choice. So Temple needs a breakup scenario, with the Big East schools that play I-A football deciding to leave the basketball schools, then deciding that they want a Philly school. What's the point of all this? In recent months, we've spent a lot of time thinking about whether Temple and 'Nova could coexist in the big time. This is the only scenario we see that allows it. Which is why a lot of Temple fans have been rooting for years for a split of the Big East. The rumor started weeks ago . . . that Urban Meyer would replace Jim Tressel at Ohio State. When Tressel resigned Monday, Meyer issued a statement saying he wasn't interested. He could have added, yet. Ohio State said current assistant Luke Fickell will be coach for the 2011 season. And if he doesn't win the Big Ten, the list of candidates to replace him will start with Meyer.